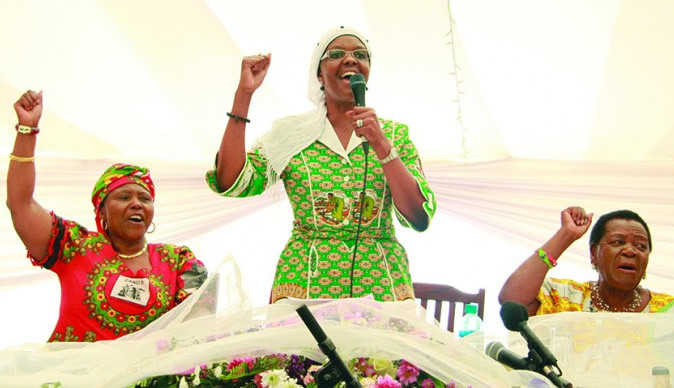 Civil society has blasted President Robert Mugabe's wife, Grace, for colluding in diverting goods confiscated from vendors to Zanu-PF supporters. Grace recently admitted that she had grabbed the goods comprising mainly used clothes brought into the country but held by customs and the police at border posts for resale. She even handed out some of them to party supporters during a rally in Zvimba. She said she had been given authority by municipalities, state security agents and Zimbabwe Revenue Authority to donate the 150 bales of clothes confiscated at the borders. Government has banned the importation of second hand clothes purportedly to protect the local industry from stiff competition. The used items were a mainstay of clothing supply for impoverished Zimbabweans. Crisis in Zimbabwe Coalition (CiZC) told The Zimbabwean that Grace's actions contradicted the empowerment programme purportedly operated by the Zanu-PF government led by her husband. "This is the antithesis of what Zanu-PF has always been preaching. The ruling party has for a long time told us that it was adopting policies and measures to economically empower Zimbabweans, but you can't achieve that by taking away from the poor," said CiZC national spokesperson, Mfundo Mlilo. The majority of Zimbabweans have turned to vending as a survival strategy, faced with rising unemployment and worsening poverty. Many have joined the cross-border trade whereby they source goods from other countries for resale in Zimbabwe. As poverty rises, urban centres have been inundated by hawkers who sell anything from pins to clothes. Recently, government ordered vendors out of the central business district in Harare, but the informal traders have been resisting moving, resulting in clashes with the police. While government says it has designated some places for the vendors to relocate to, the traders insist that the alternative vending sites are not good for business as there are no customers. "Ironically, Grace came out in support of the vendors when government was trying to drive them out. It is therefore a contradiction that she is taking from the vendors to give to her party's supporters so as to gain political mileage. "We condemn Grace's admission and actions in the strongest terms and, as civil society, we won't sit back as powerful people take advantage of the poor. What she has done adds to a crisis that we are already saddled with," added Mlilo. He said diverting the goods was illegal, as some of the goods were linked to cases pending in the courts. "The authorities have different reasons for confiscating vendors' goods at the border or at selling points. It is clear that when that happens, the cases either go to court or the owners are made to pay fines. "Worryingly, some of the cases are still before the courts and it is possible that the vendors would be acquitted, yet Grace rushes to take those goods. It is mysterious how a person who is supposed to be the First Lady gained access to the goods and justice must prevail. This is daylight theft and blatant disregard for our laws," said the CiZC spokesperson. Meanwhile the Zimbabwe Informal Sector Organisation is planning to take Grace to court. In a recent statement, ZISO said the confiscation of the goods was a violation of the rights of the vendors. "We are disturbed by the statements attributed to Grace Mugabe. She announced that she intended to donate wares that were confiscated from the vendors by the municipal police. This is an illegal exercise," reads the statement. The organisation questioned the laws applied by the municipal police in confiscating the goods and urged government to continue to uphold the rule of law, in particular the respect for property rights. "Ziso will make an urgent court application to stop the First Lady from donating wares which do not belong to her. The move by the First Lady has the potential of encouraging people to venture into corrupt practices within the informal sector using her name." Vendors who spoke to The Zimbabwean expressed anger at Grace, accusing her of insensitivity. "Zimbabwe must be the only country in this world where the wife of a president can do whatever she wants with the people. She (Grace) claims to be promoting the welfare of disadvantaged children at her orphanage yet she is busy stealing from us. "What is the difference between those kids she claims to be looking after and our children? Does she want our kids to die of hunger? How will we send them to school if she is busy taking our goods away to give to people who didn't sweat for them. This is a shame," said Veronica Gwaza, 31, a used clothes vendor operating at the Southerton banking mall in Harare. Another used clothes vendor at the same site, Godfrey Munyoro, 40, supported ZISO for attempting to bring Grace to trial, but was doubtful that the move would succeed. "Grace is law unto herself and even the president cannot stop her. If she could force the authorities to give the goods, what hope is there that the courts will try her?" said Munyoro. He urged ZISO and other pressure groups to cause the arrest of those that had handed over the bales to Mugabe's wife. "I don't know what example Grace is sending to the people of Zimbabwe. As the First Lady, she should be a role model, but she is behaving like someone from the streets. Zimbabwe needs salvation and we must pray for Grace," said another vendor who spoke on condition of anonymity.